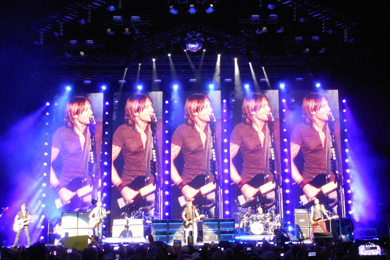 Keith Urban in Georgia on his 2013 ‘Light The Fuse’ tour. Without a doubt, Keith Urban is igniting a flurry of excitement across the country during his current tour with opening acts Little Big Town and Dustin Lynch. 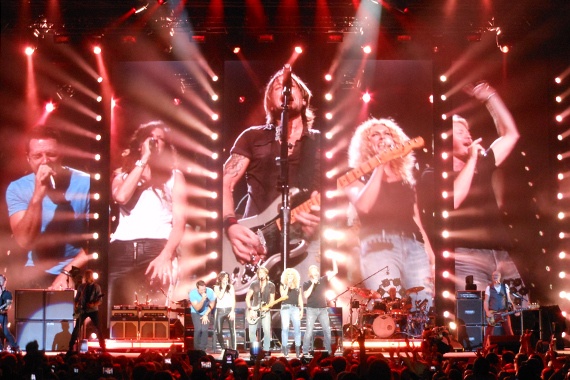 On Saturday (July 27), Universal Music Group invited a group of Nashville industry players to Alpharetta, Ga.’s Verizon Wireless Amphitheatre at Encore Park to experience the second week of this headlining phenomenon billed as the Light The Fuse tour. Fresh from his role as a judge on season 12 of American Idol, Urban proved a reliable authority not only for vocal prowess and entertainment charisma but for production quality. Together with set designer Travis Shirley, Urban has created a signature experience including lighting, CGI, video and confetti cannons for a must-see spectacle. Throughout the evening, the Georgia audience was treated to a sampling of his new music with the tunes “Little Bit Of Everything” and “Even the Stars Fall For You,” alongside a slew of recognizable hits including “Kiss A Girl,” “Sweet Thing” and “Stupid Boy.” Event surprises included UMG opening act Little Big Town joining Urban for “You’re Gonna Fly,” as well as a satellite stage in the lawn, and to the delight of the audience, an invitation from the singer for two sign-waving sisters to join him on stage for a conversation and picture. Although Urban is capable of carrying the show solo, his talented bandmates Danny Rader, Brian Nutter, Chris McHugh and Jerry Flowers add a thrilling dimension to the audio and visual production. Meanwhile, Urban remains a dedicated musical cheerleader for his audience, as the first one on the stage and the last to leave. There is never a time the class act isn’t wearing his heart on his sleeve. Judging from the Georgia show, crowds are having no trouble embracing the entertainer as their own. Catch upcoming dates for the 2013 tour here. Urban’s forthcoming album Fuse will be available September 10.